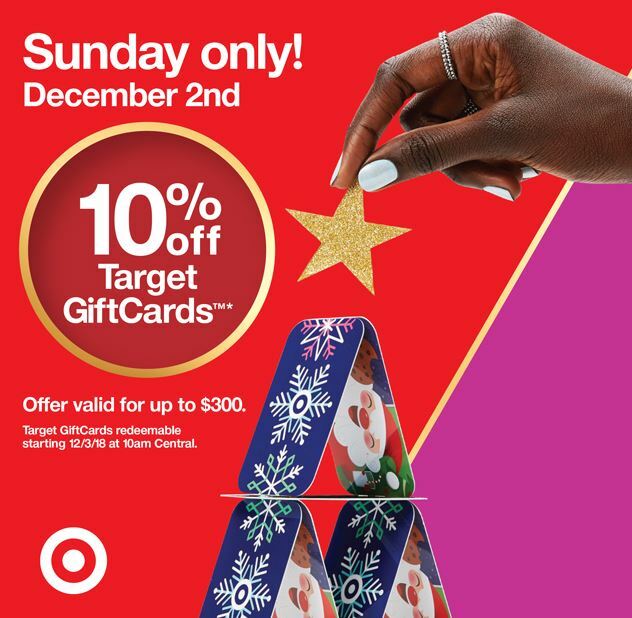 Today, Sunday, December 2nd only, Target is offering 10% off Target GiftCards* in-store and on Target.com. No coupon or code needed—the discount applies at checkout. These are perfect for gifts, or if you want to purchase them at a discount and make purchases of your own later. *Offer restrictions: Target GiftCards purchased during 10% off offer may be redeemed beginning Monday, December 3rd at 10am Central. Offer valid for up to $300 in Target GiftCard purchases ($30 maximum discount) per household. Minimum Target GiftCard purchase is $10. Limit one transaction up to $300 in Target GiftCards on Target.com.